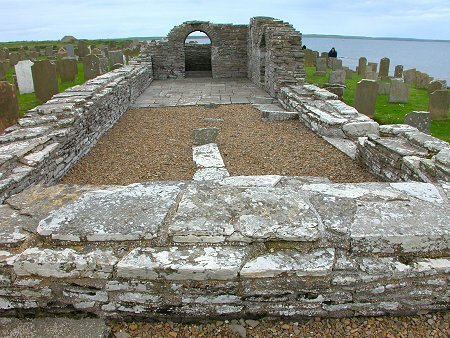 Cross Kirk is one of two surviving ruins of medieval churches on Westray: the other is Lady Kirk in Pierowall. The original building dates back to the mid 1100s, though it was later enlarged. 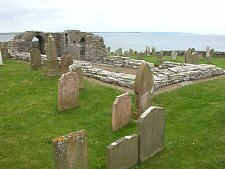 It stands surrounded by its kirkyard above the shore near Tuquoy. You reach Cross Kirk by driving past Tuquoy to a small parking area on the shore overlooking the Bay of Tuquoy at grid reference HY 459 436. 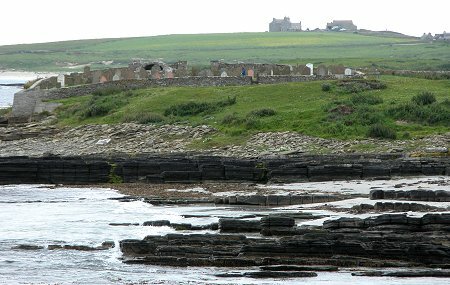 From here a grassy path leads you half a mile round the Point o' the Scurroes past a barn to Cross Kirk itself. The view you first get of it along the shoreline is very striking. The approach to the church itself can be a little confusing as the main path leads along the outside of the north wall of the kirkyard before coming round the west side to the main gate. Passing to the left rather than the right of a wall a hundred yards back gives you the option of entering via a stile crossing the east wall of the kirkyard. 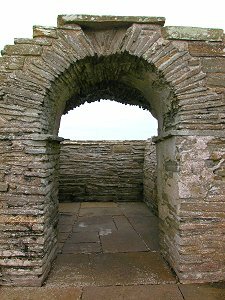 As constructed in the 1100s the church comprised a small nave with a slightly offset rectangular chancel at the eastern end. The later enlargement, probably in the 1600s, more than doubled the size of the nave by extending it westwards. The kirkyard remains in use, and there are many fine and fascinating graves on view here. 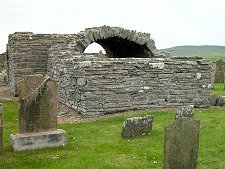 Cross Kirk itself comprises just a few courses of masonry at its western end, though the walls steadily rise as you move east, culminating with the chancel, part of whose vaulted roof remains in place. 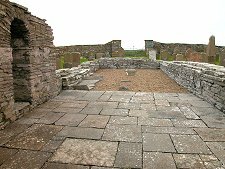 Also still standing are the door and one window in the south wall of the original nave, the extent of which is marked by the flagged area of the floor. The later extension is floored in gravel.